The main aim of the team here at Alloutslots.com is to provide recommendations based on our own online gambling experiences. We only list what we believe to be fair and safe casinos for players to use. Our reviews and star ratings are our own and not influenced by external factors. However, occasionally, we do accept compensation which may affect the list positions of brands on this page. Set in the depths of outer space, Space Wars is a five reel and four row slot game with a theoretical return to player percentage of 96.8% and a whole host of fun alien symbols. Players can control betting amounts by altering their bet level and coin value whilst enjoying a game which features wild substitutions, stacked symbols and free re-spins. 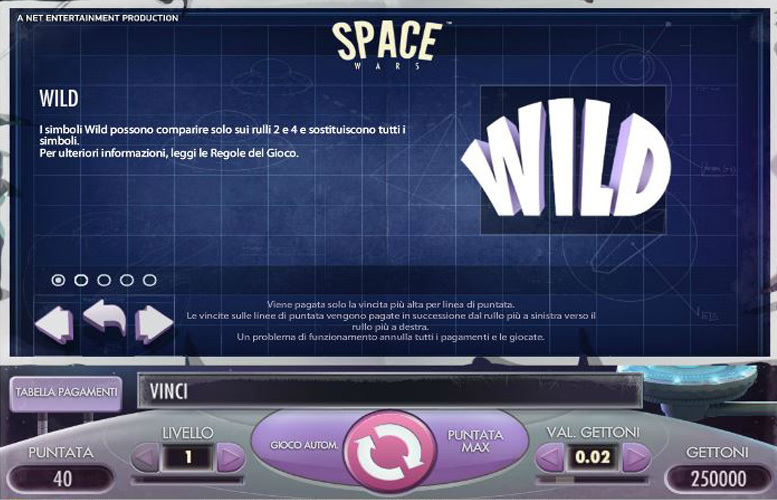 Space Wars is a fun and fairly straightforward slot which any sci-fi fan is sure to enjoy. To give you a better idea of how it works, our full review found below will detail the game’s top jackpot, special symbols, paytable and betting limits. All of the symbols found on the Space Wars reels take an inter-galactic theme, and the most valuable symbol of all is one showing a collection of red crystals growing on the surface of a far off planet. 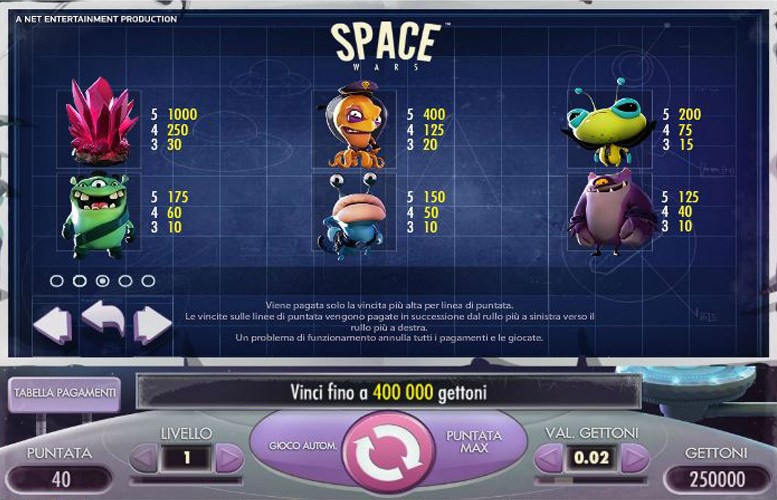 If five of those symbols appear in combination across one of the game’s 40 paylines, the combination is worth 1000 times a player’s chosen bet level. At the highest possible bet level of 10, therefore, that combination results in a payline jackpot of 10,000 coins. If the combination were to appear on all 40 paylines at once, furthermore, the game’s top jackpot of 400,000 coins would be achieved. With a maximum coin value of 50p able to be selected, that top jackpot could be worth £200,000 to any player who is lucky enough to win it. Space Wars is a pretty simple slot game and as such has only one special symbol and one further additional feature. The special symbol is the game’s Wild and the extra feature is the re-spin which automatically results after any winning combination is achieved. 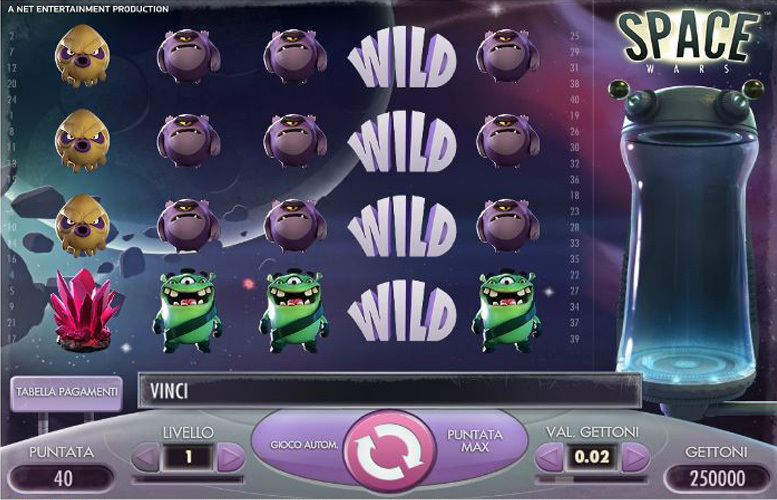 Wild Symbol – the slot’s Wild symbols can appear anywhere on reels two or four during both the main game and re-spins, and substitute for all other symbols. Those substitutions are always applied in order to produce the most valuable possible combination for any payline. 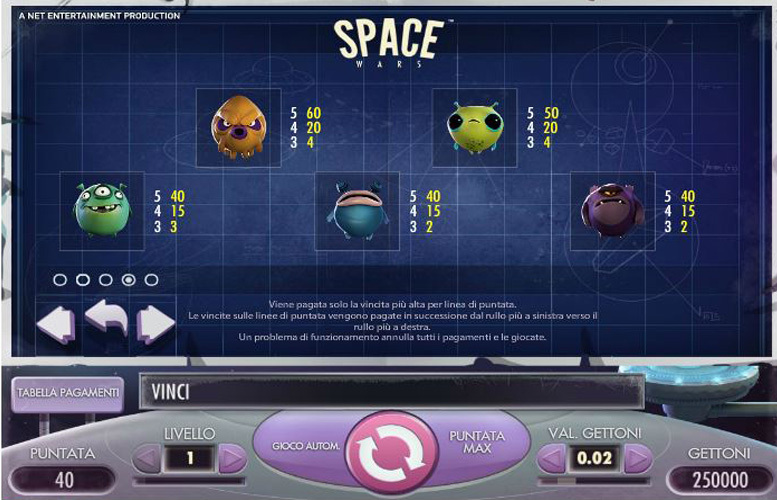 After every winning spin, a Space Wars player benefits from an automatic re-spin. That re-spin takes place on different reels and before it occurs the winning symbol of the initial successful payline appears in the game’s ‘Cloning Pod’. The symbol is cloned and those cloned symbols are then shown stacked on the re-spin reels to improve a player’s chances of winning combinations. All re-spins are played at the same bet level and coin value as the winning spin which activated them. Aside from the above exceptions, the majority of symbols on the Space Wars reels depict aliens and other space themed images. The most valuable symbol shows a growth of red crystals and a combination of five of those symbols pays out at a rate of 1000 times the bet level. That results in a paylinepayout of 10,000 coins at the maximum bet level of ten, therefore, and an overall top jackpot of 400,000 coins if the combination is seen on all 40 paylines at once. After that symbol, the next most valuable is the one which displays an octopus-like alien, and five of these pay out at a rate of 400 times the bet level. For this combination, then, a payline jackpot of 4,000 coins can result at the top bet level and a total payout of 160,000 coins if all paylines show the combination concurrently. Space Wars is a slot with 40 pre-set paylines which are all always active, but players do have control over their stake amount through the adjustable bet level and coin value. For each spin, players can choose between six coin values from 1p to 50p and ten bet levels between one and ten, which determine how many coins are bet per payline. The minimum possible stake for a spin, therefore, is just 40p and can be set by choosing a coin value of 1p and a bet level of one coin per payline. The maximum, on the other hand, is £200 and can be selected by setting a coin value of 50p and a bet level of ten coins per payline. When it comes to an overall assessment of Space Wars as a slot game, it is essentially a game of two halves. The slot excels when it comes to its potential jackpot amounts, with the overall top payout of 400,000 coins – which could be worth as much as £200,000 – comparing very favourably with those available through other games. Actual gameplay and features to add to the fun and excitement of the slot, however, is Space Wars big area of weakness. The slot’s free re-spins after each winning combination are a nice addition but aside from this, there are only traditional Wild substitutions as a further feature and these are present in all slot games. Space Wars, then, is a slot which will only really appeal to those players looking for a simple and easy game with impressive payouts. Any players wanting an immersive and innovative gameplay experience, would be best served looking elsewhere. This game has a rating of 4 / 5 with 328 total reviews by the users. 2. Free to play slot games. 3. Bonus deals & free spins. What Are The Best Slot Machines To Play Online? Marvel Slots Discontinued: Why Have They Been Removed? Are Online Slots A Scam & Rigged?